Yes it’s that time of year where grey Britain becomes Great Britain, the clouds part, Mr sunshine gives us a red tan (because no one ever has any lotion), the shorts are dusted off, and after months of miserable rain, we all complain it’s too hot. That’s the beauty of England, we might like to moan about the weather after a couple of days but by jove we learn to appreciate it! It’s this time of year where great British traditions shine through; the long standing british motorbikes finally get their day, the soft top car finally gets to have the roof down, we all get excited when the chime of the ice cream truck comes around, and bucket and spade sales go through the roof. This month we’ve only gone and put summer in a bucket, that’s right, those amazing creations you use to build sand castles are now a brand new way to enjoy an ice cold drink; because who else loves taking a bucket and spade to the beach, building a massive castle, with walls, and a moat, more than us. Or maybe you just like to dig a big hole like me! To finish it off we’ve even added an elderflower & ginseng ice lolly on top because who doesn’t love a lolly on the beach?! But enough on how it looks, we wanted to add something truly British to the mix, that’s why as a proud part of this cocktail we’ve used Kamm & Sons, a true British Aperitif made in London. 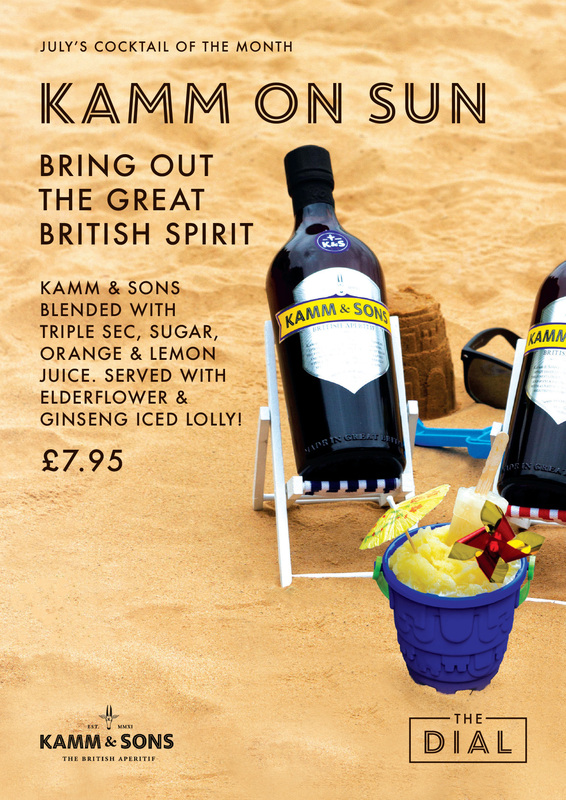 Kamm and Sons is a truly special one of a kind spirit that mixes 45 natural botanicals to produce a fragrant, delectable experience. This is mixed with Triple sec, Sugar, orange & lemon all blended together to produce an iced cocktail straight in a bucket. So for T-shirt tans and beach balls, head to your nearest beach, for creative ideas and sumptuous cocktails, you’re already in the right place!